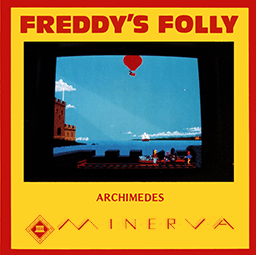 Sir Freddy is a sneaky and mean man who lives in a castle on an island. He turned green with envy when you built a better and stronger castle across the sea. He got a fleet of balloons so that he didn't get wet and then planned to bomb your castle with ease. What a cad to think of this wheeze! 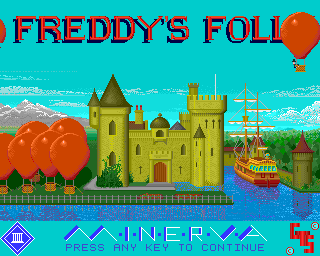 You in turn employed a gun crew to build a battlement with a good view to shoot down Sir Freddy in his balloon. To match your defensive intent, Sir Freddy phone the Ship Shop and hired several Gun ships to shoot your cannon crew. 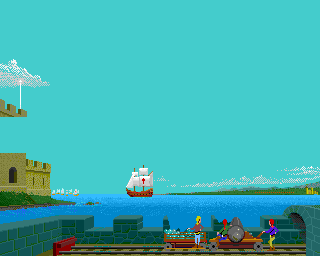 You must defend your castle and shoot down the balloons and the invading ships.